3rd, 4th and 5th month: The growth of the hair starts again. The product must be applied to the scalp twice a day, gently massaging into the scalp for 30 seconds. You do not need to wash or to rinse. The benefits arise in different styles from organism to organism. In the beginning of the treatment it's normal that the weak hair falls, to then grow other new, strong and beautiful hair. Comprobado contra la calvicie, caspa, caída de pelo, sebo excesivo, oleosidad y alopecia. BALDNESS: The most common, no doubt, it is called Alopecia or male baldness. This manifestation can be associated to high level of male hormones in the blood. This kind of baldness is caused by the increase of alpha 5 redutase in the scalp. HAIR LOSS: Caused by the weakness of thecapillary root, which makes the hair fall out. DRY AND FRAGILE: The sun, the wind and the pollution are all factors that cause the common problems. NO BRIGHTNESS, VOLUME AND SLOW.GROWTH:This problem is caused by the need of oxygen, it is caused by the atrophy of hair follicle. 3) The effects of the fungus that infect the scalp. 1. Aproximately how long it will take to get my order? 2. Can I use Ervamatin after showering with damp hair then blow-dry it? 3. How many times may I wash my hair while using the Ervamatin Hair Lotion? 4. How long should I wait before I notice a difference? (Ans.) If you use the product as directed i.e. massaging Ervamatin into the Scalp for 2-3 minutes twice daily you will see results in three weeks. 5. Can I use Ervamatin with other hair treatment e.g. Minoxidil lotion? 6. Is it likely that hair fall may increase initially after I start using Ervamatin? If so for how long? 7. Also, is it possible that after starting to use Ervamatin, there is no initial increase in hair fall and after one month or so, the hair gets to thicken and becomes dandruff free and gets better with continual usage? 8. For how long (in terms on month) should I need to use your product? Will my hair start to fall again if I discontinue to use Ervamatin? 9. Can I use oil or hair gel along with Ervamatin because my hair is always dry? 10. What are the ingredients of the Ervamatin Hair lotion? 11. 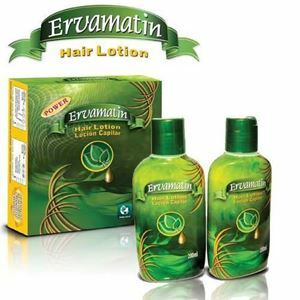 What is the success rate for the Ervamatin Hair Lotion? 12. Rogaine and Propecia are the famous drugs for treatment of male baldness. Does Ervamatin use any of these drugs in any form? 13. I am a student and so before spending I want to know the pros and cons and what are the possible consequences. 14. How many bottles should I order first to see any effective change in the hair? 15. Also as I have read DHT is the main cause of Hair Loss. How does Ervamatin fight DHT?